5. Light-weight & special design. This Multifunctional pipe Wrench specially used for Faucet and Sink( nuts/Shut off valves/Strainer Baskets/Supply Line Nut/Faucet Nut sect), and it has higher efficiency. MULTIFUNCTIONAL AND EFFICIENT DESIGN: Faucet and sink wrench is designed for water pipes and faucets, suitable for small space operation and easy to rotate. The extra-long design allows you to turn hard-to-reach mounting nuts on faucets, sprayers and ball valves. Also, damage to the chrome can be avoided when the valve is closed. EXCELLENT QUALITY: The wrench is made of lightweight, high-strength plastic and durable aluminum alloy which is compact, lightweight and clean. Plumbing tools is a must-have gadget for your family. EASY TO USE: Simply snap the position and rotate quickly, then replace the nut installed from the faucet. 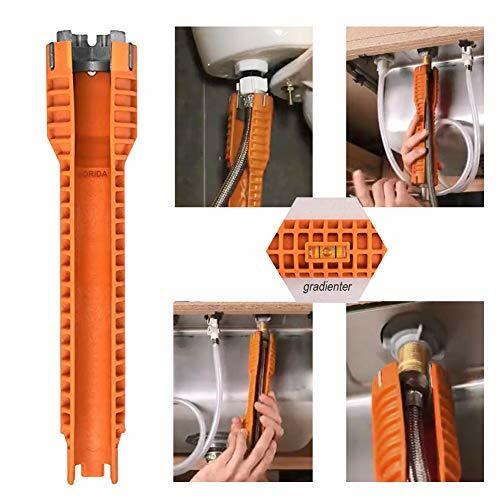 This repair and installation hand tools suit for Faucet and Sink Installer. Especially for nuts/Shut off valves/Strainer Baskets/Supply Line Nut/Faucet Nuts - Toilet Bowl/Sink/Bathroom/Kitchen Plumbing and more. 100% SATISFACTION GUARANTEE:30 Days Money Back and 12 Months Warranty. If you're unsatisfied with the wrench during the first 30 days, you are eligible to receive a full refund - What are you hesitating? Try the new hand tool now!